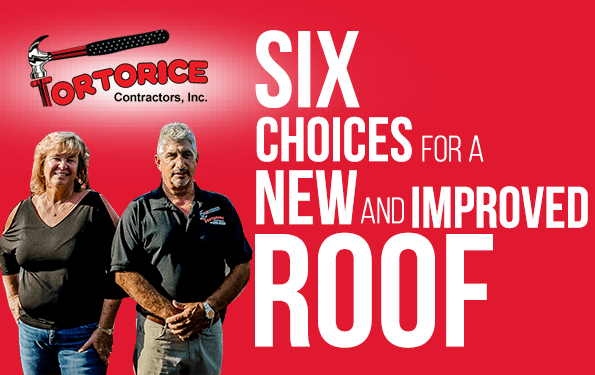 Medford Township NJ Roofing Contractor: 6 Choices For a New and Improved Roof - Tortorice Contractors Inc. It is very exciting to build a new house. You can design it any way you want and put your furniture of choice in it. However, homeowners also face a lot of choices when it comes to design, paint, and other materials needed for their house. One of the most complicated and daunting choices is choosing a roofing material. According to Medford Township NJ roofing contractors, there are so many new and traditional roofing materials available today. They are all different and each choice has its own pros and cons, as well as a different durability. Here are some of the most popular choices for roofing materials in the U.S.
Asphalt shingles are perhaps the most popular choice for roofing materials in many states. According to roofing companies from Medford Township NJ, approximately 7 out of 10 houses in the U.S. have asphalt shingles as their roofing material. This is a popular choice because they are very durable (they last between 20-30 years) and require minimal maintenance. The shingles also work well with many different architectural styles and are very easy to install. The roofing company from Medford Township NJ can install 3-tab shingles or you can upgrade to something thicker for more durability. However, there is a drawback to asphalt shingles. Since it is so popular, you won’t stand out from the crowd with it. If you want to go for a classic look, take a look at wood shingles. This classic roofing material ages well and weathers to a gray or silver color. If installed properly by a roofing company from Medford Township NJ, this material can last up to 50 years. This type of roofing material looks good in cottage or craftsman style home designs. Wood shingles may be beautiful but they can be a pain to maintain. According to Medford Township NJ roofers, they require constant maintenance such as removal of rot, mold, and mildew. This type of roofing also requires regular application of oil to make it waterproof and to preserve its durability. It is also not fireproof. Make sure you understand the pros and cons of wood shingles and that the roofers from Medford Township NJ know the proper installation of this material. If you want something that is low maintenance with the traditional look of wood shingles, consider engineered tiles. They can be made to look like different types of roofing materials and most of them meet fire code restrictions. This choice can be cost-effective and durable. Make sure to discuss this option with a roofing contractor from Medford Township NJ. Although it’s not as popular as asphalt shingles, ceramic tiles are typically used in many Mediterranean style houses. Ceramic tiles are beautiful but heavy. You need to ensure that the tiles have adequate support or the roof could end up collapsing. They are also more difficult to install. If you want ceramic tiles with a small carbon footprint, talk to your Medford Township NJ roofing company so that you can buy locally sourced ceramic tiles. You can’t go wrong with choosing a metal roof. They come in many different colors and styles. They are also very lightweight and durable. Metal roofs can be used in all types of climates and weather. They are also reasonably affordable and easy to install. Metal roofs can last a long time (up to 50 years) and even longer if it is well maintained. For locations that see a lot of rain, roofing firms in Medford Township NJ recommend to rust proof and weatherproof the material for added longevity and durability. Slate is beautiful, elegant, and natural, but also very expensive. It is a good choice for cold areas because it sheds ice and snow naturally. Aside from being expensive to buy, it is also more expensive to install compared to other roofing choices. If you want the slate look but don’t want to spend extra cash to buy the real material, you can look for engineered slate made from tiles. They look like slate but come without the costly price tag. Many roofers from Medford Township NJ do not recommend installing slate or dark colored engineered slate tiles because they have a poor solar reflection. This means that the dark color of the material will make your roof and ceiling area hotter. According to Medford Township NJ roofing contractors, the type of roof has a big impact on design and cost. Research your options and style to make sure that you choose a roof that does not only match your style but your budget too. Choose something with low maintenance if you have a busy lifestyle. The next step is to discuss your options with your roofer so that you can choose the best roof for your new house.